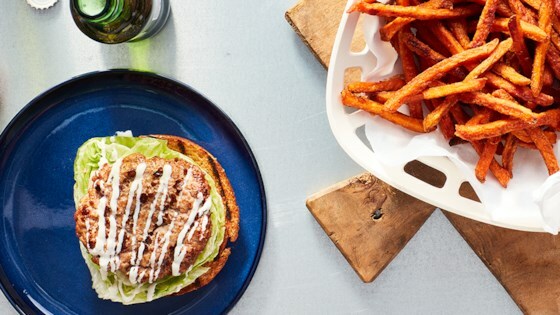 "Ranch seasoning is added into these grilled turkey burgers as well as tossed with a side of sweet potato fries to make this delicious meal that's ideal for easy entertaining." Burgers: Preheat a grill or pan over medium-high heat. Mix together the turkey meat, yogurt, Hidden Valley(R) Original Ranch(R) Salad Dressing and Seasoning Mix and pepper. Form into 4 to 6 patties, depending on how large you want them. Create a 1/4-inch indentation into the top of each patty. Grill for 6 to 8 minutes per side, or until cooked through. Top each slice of bread with lettuce and burger patties. Sweet Potato Fries: Preheat the oven to 425 degrees F. Spread the sweet potato fries in one layer on a sheet pan. Drizzle with the olive oil and add Hidden Valley(R) Original Ranch(R) Salad Dressing and Seasoning Mix. Toss well to coat evenly. Cook according to package directions, shaking the pan once halfway through cooking, 20 to 25 minutes. Serve burgers and fries together with bottled Hidden Valley(R) Original Ranch(R) Dressing, for dipping.